You can easily import quizzes from programs that create QTI files. If a program does not create QTI files, it cannot be imported into Canvas. Quizzes created in Respondus 4.0 (Windows software) can be exported as QTI packages. To learn how to use Respondus 4.0 refer to this user guide (DOC). A QuickStart guide for Respondus 4.0 is also available (PDF). Quizzes created in Blackboard (WebCT, Angel) can be exported as QTI packages. Quizzes created in Moodle can be exported as QTI packages. This will work with Moodle 2.0 or older versions. However, Moodle 2.1 and newer versions no longer export QTI packages. Canvas supports QTI versions 1.2 and 2.1. Quiz exports will not include questions from quizzes which use randomly selected questions from question banks. 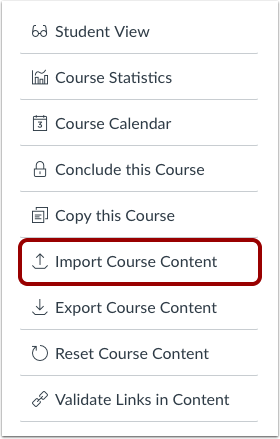 Click the Import Course Content button. In the drop-down menu, select the QTI .zip file option. 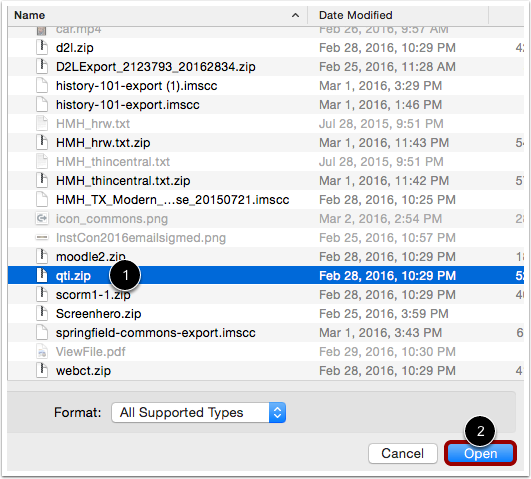 Find and click the ZIP file you want to import . Click the Open button . To import assessment content created in Quizzes.Next, click the Import assessment content as Quizzes.Next option. Selecting this option will convert assessments in the import package to Quizzes.Next format. If not selected, assessment content will convert to Canvas Quizzes format. Note: You cannot select a default question bank when using the Import assessment content as Quizzes.Next option. To overwrite the assessment content with matching IDs, click the Overwrite assessment... checkbox. Some systems recycle their IDs for each new export. Therefore, if you export two separate question banks they will have the same IDs. To prevent losing assessment data Canvas treats the question banks as separate objects despite the IDs. Choosing this option will disable this safety feature and allow assessment data to overwrite existing data with the same IDs. 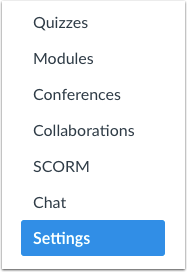 In the Default Question bank drop-down menu, select the Question bank you want to use for your question bank. If you do not have a question bank you want to use, you can create a new question bank. In the drop-down menu, select the Create new question bank option. When the course has completed, view your quizzes by accessing the Quizzes page Course Navigation. Note: If you imported your assessments to Quizzes.Next, you can view your quizzes from the Assignments page. Previous Topic:What options can I set in a quiz? Next Topic:How do I create a quiz with individual questions? Table of Contents > Quizzes > How do I import quizzes from QTI packages? Re: HOW CAN I IMPORT QUESTIONS FROM A TEST BANK INTO A QUESTION BANK IN CANVAS?